Rasgullas. Jhal Muri. Mishti Doi. 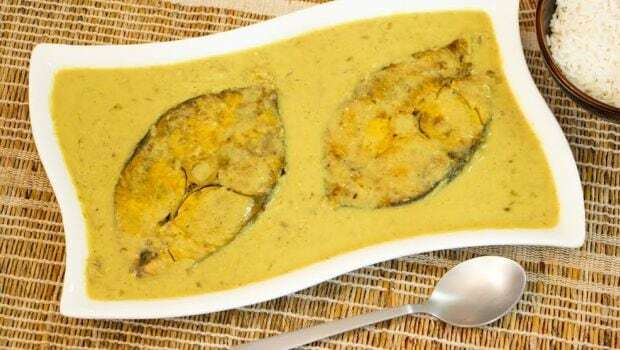 Hilsa curry. What do these dishes have in common? Apart from being very delectable, they are from the state of West Bengal. There is an array of vegetarian and non-vegetarian options that one can pick from, and let’s not forget their infamous variety of sweets. There are British, Mughal, South Asian, Burmese and Chinese influences that are seen to be interweaved in their cuisine due to its historical and trade links different parts of the world. Having Turkic rulers over the region from the 13th century to being governed by the British for two centuries, the influence is evident in the food of Bengal. Bakeries were established with the arrival of Jews, and the exiled families of Wajid Ali Shah and Tipu Sultan made Mughalai cuisine a prominence in this region. Mustard oil is widely used in this cuisine, giving their dishes a very distinct flavour. A popular spice mix amongst this region is ‘paanch phoron’, which translates to ‘five spices’ with cumin, mustard, fenugreek, fennel and nigella seeds. We’re all familiar with the iconic ‘Rasgulla’ or ‘Roshogulla’ as it is fondly known, but there are other Bengali treats that will indulge your sweet tooth. Mohang Bhog is a laddoo-like sweet made from rava and is sugary treat for many occasions. The Malai Chom Chom is a must try as it a lip smacking sweet made from chenna and malai. While you’re at it, try some decadent Channar Jeelapi; made from maida, khoya and chenna. We could go on and on, for Bengali sweets will surely satisfy any sweet cravings you might have. The abundance of vegetarian dishes that boasts volumes of flavour are prepared from fresh and seasonal vegetables and will delight all the vegetarians out there. Aloo posto, Shukto, Begun Bhaja etc. are some delicious veggie options you should try. Chicken and mutton are favoured meats among Bengalis and there are some extremely delectable mutton dishes like Kosha Mongsho, which is a velvety and indulgent mutton curry that is a must try. But these meats can’t out beat the popularity of fish in Bengali cuisine. Fish is a prominent part of the Bengali diet and fish and rice is a staple among many Bengali households. Geographically speaking, West Bengal boasts of a lot of freshwater lakes, ponds and a coastline, making fish a main part of their diet. Fish also plays an important role in traditional rituals like weddings, wherein the groom’s family gifting the bride’s family fish is considered to be a symbol of well-being and good luck. There are numerous varieties of fish that are local to Bengali cuisine like Catla, Hilsa, Rohu, Magur (catfish), Roopchand, Bhetki, Chingri (prawns), etc. Almost every part of the fish is consumed, except the fins and innards, and the fish head is particularly used to flavour curries. Maccher Jhol is a traditional fish curry recipe popular across West Bengal and is a flavourful, spiced curry that is usually made with Rohu fish. Other popular fish recipes include Fish Kabiraji, Bengali Doi Machch, Sorsebata Ilish Mach etc. Is the thought of having all this making you drool? You don’t have to go all the way to West Bengal to try your hand at authentic fish delicacies. You’re in luck as we supply fresh fish flown in from Kolkata, so you can get a taste of Bengal, right here at Brown Apron.